A band that needs no introduction with 10 years in the Japanese Music Industry, Alice Nine started out as a Visual Kei group and has matured over the years together with their music. In town as part of the Alice Nine TOUR 2014 [Supernova Symphonia], Elliott Danker & Kenneth Wong met band members Shou, Hiroto, Tora, Saga and Nao to talk about the experiences of their world tour and how their style has evolved over the years. 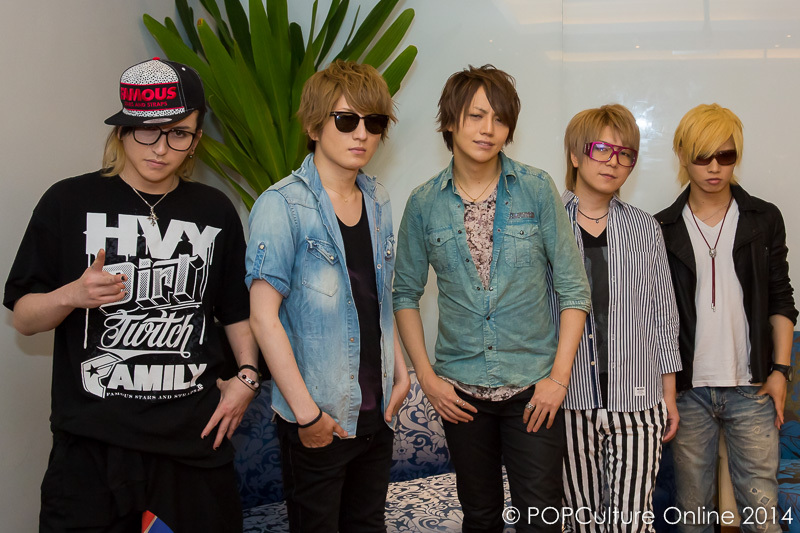 POPCulture Online: How has the world tour been for Alice Nine? The band has been able to visit some of the places that Japanese people seldom go such lesser known cities in China and it was fun learning about these cities which the band has come to appreciate. POPCulture Online: Supernova Symphonia is a combination of 10 years of hard work, tell us about your music and what it feels like to have done this for 10 years? In the past few years, Alice Nine has been to places such as Germany and Los Angeles for events (non solo live gigs) and have seen the boom in the trend of animation and other related popular culture. But the band didn’t really want to just follow the trend, we wanted to see the type of fans we had there. After 10 years, through media like the internet and social media platforms such as twitter, the band realised that they had lots of fans outside of Japan in Asia and that ultimately prompted us to have a world tour. We were about to meet these fans as a result and show them our appreciation. POPCulture Online: Alice Nine has released a DVD single called Number 6 which contains a short movie they acted in it. Does the band have any other plans to release a similar kind of DVD single in the future? The band does have an intention to try something similar again but since we are musicians, we tend to assume that acting isn’t our strongest skill. But we do want to try it again as a challenge and to practice our acting skills for possibly more of such singles and DVDs. POPCulture Online: Alice Nine’s 10th anniversary is a milestone for the band, if they could break or set a new record, what would it be? Alice Nine is recognised both in Japan and Overseas by both fans and media alike and we’d like to continue to work hard to develop ourselves in the domestic market first, then the rest of the world. The band also aims to visit more countries especially those further from Japan and finally and most importantly to continue to stay as a band for many more years to come. POPCulture Online: Name one interesting incident that happened while the band was on their Supernova Symphonia world tour? When the band was in China, we were surprised at the toilet paper couldn’t be flushed away due to the water pressure not being strong enough unlike like in Japan but Singapore is alright. POPCulture Online: If the members of Alice Nine were not musicians, what would they be? Tora-san: I wasn’t really thinking of becoming a musician but randomly thinking of what I could do with my life and accidentally ended up being one (a musician). Probably if I weren’t a musician, I would be doing nothing. Shou-san: I like to create things so I would still be a creator or an artist, possibly like a chef. Hiroto-san: I recently quit smoking and started on sweet stuff so with this in mind, I would want to be a pâtissier who makes cakes and sweets. POPCulture Online: In the music industry, it is not uncommon to see bands changing members or even disbanding. Alice Nine has stayed together for 10 years so how has the band managed to stay together as the original 5 members so far? The initial concept for the band was to be able to talk about anything and no secrets between the band members and the band members also know everything about each other. POPCulture Online: Alice Nine is known to be a Visual-Kei band. Is it important to keep this Visual-Kei image as a band or as a Japanese band? Other Visual-Kei bands are usually more casual or more pop in their dressing so to differentiate Alice Nine from other bands, we have been more Japanese like with a hint of Gothic in their dressing. But now the band is not concentrating too much on the costumes itself because they want to focus on the music and keep their outfits in an elegant style in an Alice Nine way. POPCulture Online: It was Saga-sans birthday a few days ago so Happy Birthday Saga-san. Would there be any special celebration for Saga-san during the live concert? When Alice Nine was in Singapore last round for a live concert, there was a woman’s bra thrown at him so this time I am expecting more. Thank you Alice Nine and we look forward to your live performance at the The Coliseum, Hard Rock Hotel Singapore, Resorts World Sentosa.